I was so happy to receive a copy of Lynne Drozdik Wardach's new book, The Jesse Tree: A Family Guide Through the Season of Advent and Philipovka in the mail last week. It is a brand new guide for families that wish to delve deeper into the Nativity Fast with daily Scripture readings, prayers, and crafts for each of the 40 days of the fast. I love that this book includes lessons for the full 40 days and not just for the typical 25 that most Advent guides do. Ancilla Press would like to give one Charming the Birds from the Trees reader a copy of The Jesse Tree: A Family Guide Through the Season of Advent and Philipovka. 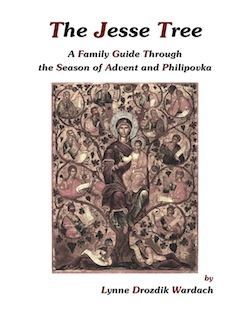 In addition, they are offering a 20% discount on The Jesse Tree: A Family Guide Through the Season of Advent and Philipovka (just click on the link and your discount will be added automatically) . In addition to their online store, you can find Ancilla Press on Facebook. For your chance to win, leave a comment WITH YOUR EMAIL ADDRESS on this post. (U.S. Residents only) Comments will close and a winner will be randomly selected on Saturday, December 17. The winner will be notified via email and announced within this post. "As any young Catholic mother, I strove constantly to weave the threads of the faith into the fabric of our daily lives wherever I was able. With the shopping, and baking, and wrapping, and visiting and every other secular activity that seemed to occupy the minds of my little disciples at Christmas time, it occurred to me that the preparation for the season seemed the perfect time to do just that, but how?" Are you spending too much of your busy time piecing together Advent devotions for your family from blogs and sites all over the Web? Do you have a Pinterest wall full of pictures but still no idea where to start? With daily Scripture readings, prayers and crafts lovingly compiled over a decade and a half, Lynne Wardach has put together an amazing spiritual and fun way for busy Catholic families to commemorate Advent and prepare for the holy feast of Christmas. The Jesse Tree draws from the rich Byzantine tradition and unfolds over the season of Philipovka or Philip's fast that begins on November 15th. This mini tour of salvation history is easily adaptable to any calendar or hectic family schedule, simply by choosing whichever of the themes you want to highlight on a particular day. With 40 themes and symbols to choose from—about twice the number of most Jesse tree guides—this book is not only a complete devotion in itself but also an excellent template for starting your own family Advent traditions right away. Each theme features representative icons and the ornaments that Lynne's children made during what she calls "the busiest, craziest, messiest, most emotional" but happiest time of life. A complete craft supply list is also provided in the appendix. looks like a wonderful book! I am very interested in the craft component...I'd like to make an Advent focus for our homeschooling next year rather than squeeze it around our usual school day! I already have this book. It's a good one - really easy to use, just open up, read the Bible reading, and a fun ornament plan. We are doing just parts of it (which they author totally recommends, having had a bunch of little kids herself), and it definitely is adding to our Advent! Congratulations, Yarka! You won! I'll e-mail you to get your address!